For many of us, the summer would not be complete without at least one trip to the beach – that sandy, sometimes rocky area between Long Island Sound and land. Beaches and dunes are formed by water and wind currents and erosion. With Long Island forming a protective barrier, the Connecticut coast is not subject to the same intensity of water and wind currents as those coastal areas lying directly adjacent to the Atlantic Ocean. For this reason, dune systems are smaller and less well developed along our coastline than in other coastal states. 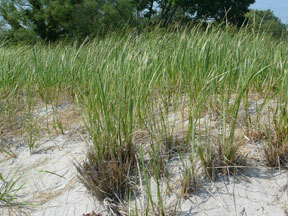 One of the most common and important plants of these dunes is American beach grass (Ammophila breviligulata). This grass has an extensive root system and can spread via underground stems or rhizomes. This root system acts as a natural erosion control device, helping to stabilize the shifting sands of the dunes. Other plants that may be found on the beaches, dunes or sand flats are dusty miller, sea rocket, Virginia rose, beach plum, northern bayberry, and the state listed plant, seabeach sandwort (Honckenya peploides). Many birds, native plants, several reptiles and invertebrates depend on these areas for survival. Numerous birds use the beaches and dune system as nesting and feeding areas. Piping plovers and least terns are two state listed birds that nest along the shoreline. Another animal that has been observed along the Connecticut shoreline and tidal marshes is the diamondback terrapin, a small turtle (5-7 inch shell length) named for the diamond patterns on its top shell. This turtle lays eggs in the sand in the early summer. Threats to the beaches, dunes and their inhabitants are numerous – ranging from habitat loss to invasive species. Disturbances include pedestrian, vehicular, and boat traffic, pets and feral animals. For more detailed information download Coastal Beaches & Dunes (PDF). Small dune system with American beach grass. 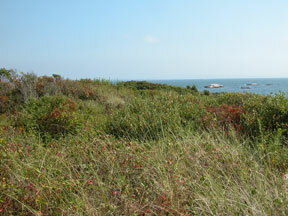 Back dune area with shrubs.